The Push-Button Hooks are for use with Stainless Steel Hangers. 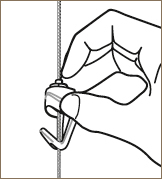 DIRECTIONS: Feed the stainless steel cable into the hole in the top of the hook. Push the button down and the hook will move freely on the cable. The hook grips the cable when the button is released. Recommended Weight: 20kg on one hook.